Photo Save the Date Cards, Photo Wedding Save the Date Cards, Photo Wedding Announcements ! If you want to guarantee that your guests will mark their calendars and save the date for your wedding, then our unique photo save the date cards will definitely get their attention. Or if you just got married or eloped, then our photo wedding announcements are a great way to share your happy news. We take several of your photos to create outstanding, one-of-a-kind save-the-date cards and wedding announcements just for you. All of our photo save the date cards are stunning, archival quality, real photographs, with accompanying envelopes, and feature multiple photos. Our artists have created original designs for our photo save the date cards, photo engagement announcements and photo wedding announcements that you won't find anywhere else. Also great for engagment party invitations. New Beloved Photo Save the Date Cards © Send us 3 of your favorite photos with your message and personalization. Also great as a wedding announcement. 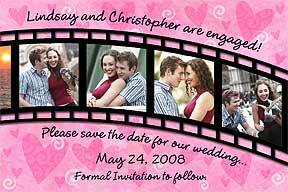 Hearts Filmstrip Photo Save The Date Cards ©Send us 4 of your favorite photos with your message and personalization. Just as nice as a wedding announcement. Wedding Bells Photo Wedding Announcements ©Send us 3 of your favorite photos with your message and personalization. Dreamy Roses Photo Save the Date Cards ©Send us 3 of your favorite photos with your message and personalization. Wedding Rings Photo Wedding Announcements ©Send us 2 of your favorite photos with your message and personalization. Can be changed into a save the date card. New Shooting Stars Photo Save the Date Cards ©Send us 3 of your favorite photos with your message and personalization. 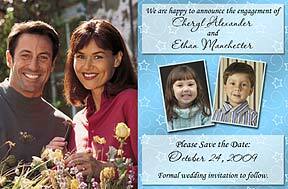 New 5 x 7 inch wedding photo save the date cards. Messages on above save the date photo cards are only suggestions. You may change the wording to create your own, personal message. Look at the sample text used in the card of your choice as a guideline to how much text can be used. 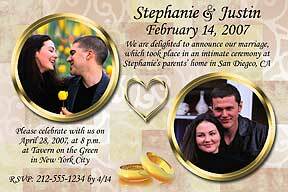 Most of the save-the-date designs can be changed into photo wedding or elopement announcements. Or if you see a photo wedding announcement card that you like, but would like to send it out as a photo save the date card, we can probably do that, too. Just let us know what you'd like your photo cards to say, and in most cases, we can adapt the design for your needs. We always email you a proof of your photo save the date cards order within a couple of business days of receipt of your emailed photos and order information. This is so that you may check it for accuracy, and we only send your order to production after we have received your approval. Please check your email often for your proof to avoid unnecessary delays. If you have not received your proof within 2 days, please contact us and we will resend it. Minimum order is 25, but you can order any amount after that. Many photo wedding announcement and save the date card companies force you to order in packs of 25, (25, 50, 75, etc.) but you can order from us 38 or 52 or 112 - or whatever is exactly the amount you actually need. Sample of a past save-the-date photo card order can be obtained if you send us $3. We will mail your specified design sample and size choice (4 x 6 or 5 x 7), along with a coupon for $3 off, if you decide to order. Photo wedding favors are also available. Photo wedding magnets (and save the date magnets) are found on our 2 x 3" Wedding & Save the Date Photo Magnets page. You might also want to consider Photo Wedding Bookmarks for a great wedding favor that can include a thank you from you for sharing the love and celebration of your wedding day.